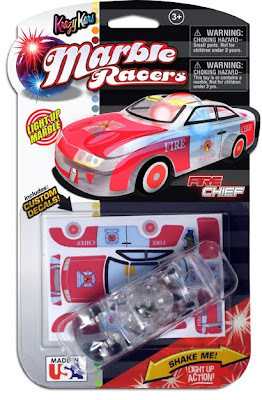 Light-Up Racers from Skulduggery are small plastic cars with an LED marble embedded in their center. The marble lights up when you shake the car hard. They are the same size as Hot Wheels racers and can run on Hot Wheels tracks. They come in 6 different designs, and each pack contains a racer and racing decals . They are available for sale at CVS. These cars are a lot of fun! It's surprising how much my kids enjoy playing with them. I guess the flashing lights make them more interesting and help spark their imaginations (they pretend the cars have laser lights, or are exploding, etc...). I like the fact that they are the same size as Hot Wheels are can run on their tracks. I also like the fact that each car comes with stickers that kids can use to decorate their cars. It makes it appealing to girls as well as boys (they actually have 2 "girly" designs"). The stickers also give it an extra crafty dimension and allows kids to express their individuality. When I first saw how these racers worked, I assumed that all you had to do to get the cars to light up was to get them rolling. I was wrong. The light-up mechanism doesn't always work -- which can be frustrating to kids. You need to bang them down hard on a surface to start them lighting up -- which can make fussy parents nervous when they see these cars coming down hard on their glass coffee tables or antique dining tables. Also, at $7.99 each, they're a lot more expensive than regular $1.50 Hot Wheels cars. Time will tell whether they are as sturdy as Hot Wheels, but for now they're providing my kids with lots of opportunities for pretend play. Light-Up Marble Racers are fun little toys that spark kids' imagination and creativity! Maximum of 10 entries per person. This giveaway ends at midnight PST on May 26, 2010; I will draw a winner at random on May 27 and post the winner's name after the winner confirms acceptance. For additional giveaway rules, click here. Good luck! Disclosure: I received a set of 6 racers from MomSelect as well as a second set to give away, but was not paid to review the product or give my opinions. Unless clearly stated, the views and opinions expressed here are my own. I don't know who would like these more.... my boys or my husband! This would be absolutely perfect for my little boy! I entered your How To Train A Dragon giveaway! I entered the Twisted Orchid bag giveaway. My daughters would have a great time with these. I think they are so cool. I am sure the whole family would enjoy playing with them, but mostly my son. I would give these to my nephew. He loves cars, and I know he would be crazy about these! I'm a fan on FB of Bonggamom Finds! My two boys would love playing with these. Thanks. My son turns 7 this month and would have hours of fun with these cars! I would give these to my grandson, he would love them, he loves to play with his cars! I would give these to my little grandson-he loves anything with wheels! I would give these to my son...it would make his day. Kyle would be thrilled if we were to win (I would be too). I would give these to my nephews! These would be perfect for my three and five year old sons. My nephews would love these! I would give these to my five year old son. My best friend from childhood has the sweetest little grandsons and I would give these to them. my 2 sons would love these! I would give this set to my son and daughter. They love playing with cars. I would give these to my son - he would love them! These would be given to my nephews to play with. They'd love them! I would give these to my sons to play with. This giveaway is now closed. Thanks to all the entrants, and congratulations to the winner: #118, Jennifer R!